Scams are all over the place these days. You probably won’t go through a single day seeing a pop up online or a phone call from a number claiming to be local that will likely be linked to a scammer. Not only that, they also employ methods that intend to get a person to act by sending the scammers as much money as possible. One of the scams that currently exists involves student loans. Of course, student loan debt is real. But only to those who have taken out loans while attending school. Once all is said and done, they are now faced with thousands in debt. But, they do their best to set up regular installments to ensure that the debt will be paid in full later on down the road. Today, we’re going to dig a little deeper into what this student loan scam is all about, how it works, and what steps you need to take in order to protect yourself from being a victim. 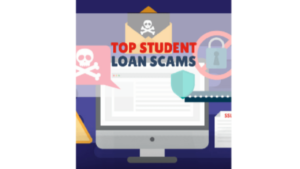 In 2017, the Federal Trade Commission (FTC) started cracking down on scammers who claimed to be associated with student loan companies. They began what was known as “Operation Game of Loans”. This started after scammers made off with a total of $95 million in illegal fees from unsuspecting victims throughout the years. So, how do these scammers operate? Scammers will typically reach you through two main mediums: telephone and email. Thanks to modern day technology, scammers are often using phone apps like Google Voice to call their potential victims. The reason being is they use local numbers and will often appear on caller IDs. A person will assume it may be a wrong number from someone residing in the area. Google Voice numbers are often hard to trace. Not to mention, most of the scammers are based outside of the United States. This is a scam will involve a student loan company that claims you can get the “best” interest rates and terms. However, in order to qualify, they ask you to pay a small upfront fee. To be more specific, the fee is likely 1 to 5 percent of the loan amount. Some scammers will often ask for a flat fee. This is a no brainer. No real student loan company will ask you for money upfront in order to qualify for a loan. You apply for it and you wait while they determine whether or not you qualify. 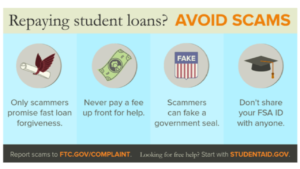 In the event that you talk to someone who claims to be from a student loan company and they ask you for money upfront, end contact and report the incident to the Federal Trade Commission. While it’s always a good idea to consolidate your student loans after you graduate, you need to also realize that this is also a hotbed for scammers. What scammers will do is pose as a company that charges a fee to ensure that your loan is consolidated. Obviously, the fee does nothing. If you hear something similar like processing fees, administrative fees, or consolidation fees, then you know it’s a scam. The US Department of Education does not charge fees for student loan debt consolidation. However, if you have a student loan through a private company, you can be able to refinance your private loans, your federal loans, or both. This will depend on the lender’s policy. Also, refinancing and consolidation are different from each other. Refinancing means that you’re taking out a new loan to pay off the student loan debt. This scam is when a scammer claims to be a law firm that is involved in a lawsuit that pertains to student loan debt. In fact, there are variations of this version of a student loan scam. But the most common one will be when the borrower is supposedly referred to a law firm by a “student aid company”. This company also claims that the firm can settle the student loan debt for much less than what you supposedly owe. If you are considering a legal option regarding your student loan debt, contact a lawyer about what can be done. Remember, there are special circumstances for this to be done, so do a little due diligence before moving forward. Yes, student loan debt has to be repaid. But unless it’s a major circumstance (like death, disability, identity theft, etc. ), the debt can be eliminated. If a company reaches out to you promising that they can eliminate your student loan debt, cut off contact immediately. That’s because the company is trying to scam you out of your hard earned money. 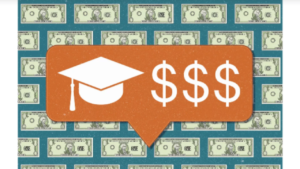 These scams relate to closed for-profit colleges and universities. A company will claim that because you attend a specific college, they will say that you qualify for a student loan debt elimination. This is not true. However, you can have your student loan forgiven through certain programs. However, there are certain guidelines that you must meet in order for that to happen. If your school is actually closed or is currently facing a lawsuit regarding loans, you might do what is known as Borrower Defense to Repayment. If you’re doing this via a private company, ask them what they are going to do for you. There are ways to protect yourself from student loan scams. In the event you come across these scams via phone or email, you must cut contact immediately. If you know the name of your student loan, call them to verify if it was actually them that made the call. Inform them about the call or email you received about your student loan. As always, you must not give any personal information that is tied to your identity to someone you don’t know. This goes for over the phone or via the Internet. Never give out your bank account information, credit card information, Social Security number, or any other financial information. Knowing what scams exists will make you aware that it exists. It will also give you an idea of what you can do to protect yourself should a scammer chooses you as the next possible victim. If you have borrowed student loans in the past, be sure to get in contact with your lender if you believe that you’ve received a suspicious email or phone call about your student loan. They’ll be able to confirm whether or not if it’s the real deal or if you just dodged a bullet. Do you have any experience with being involved in a student loan scam? Do you have any questions concerning this scam review? If so, please leave your comments or questions at the bottom of this post, and I will be more than happy to get back to you. Thanks again for checking out my post, and good luck with your success online..